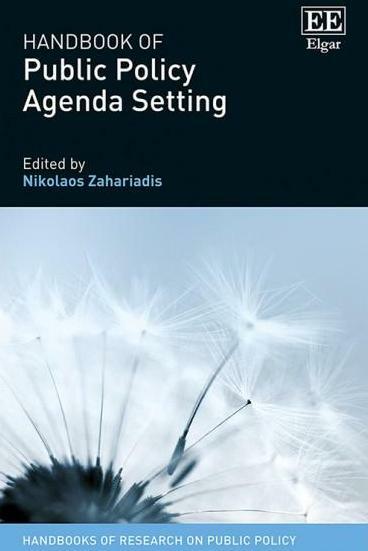 Setting the agenda on agenda setting, this Handbook explores how and why private matters become public issues and occasionally government priorities. It provides a comprehensive overview and analysis of the perspectives, individuals, and institutions involved in setting the government's agenda at subnational, national, and international levels. Drawing on contributions from leading academics across the world, this Handbook is split into five distinct parts. Part one sets public policy agenda setting in its historical context, devoting chapters to more in-depth studies of the main individual scholars and their works. Part two offers an extensive examination of the theoretical development, whilst part three provides a comprehensive look at the various institutional dimensions. Part four reviews the literature on sub-national, national and international governance levels. Finally, part five offers innovative coverage on agenda setting during crises. The first of its kind, this Handbook will be the definitive reference tool in public policy agenda setting for scholars, students, and practitioners in political science, public policy, public administration, and mass communication.